Explanation: Could an asteroid destroy civilization on Earth? Mountain-sized space rocks could potentially impact the Earth causing global effects, and perhaps even be mistaken for a nuclear blast of terrestrial origin. Such large impacts are rare but have happened before. Modern telescopes have therefore begun to scan the skies for signs of approaching celestial hazards. Over the past year, projects such as Spacewatch and Spaceguard have continually discovered previously unknown asteroids that indeed pass near the Earth. Such projects are still rather modest, however. In June, 100-meter asteroid 2002 MN was discovered only after it whizzed by the Earth, crossing even within the orbit of the Moon. This year brought much discussion in the astronomical community of expanding technology to discover most large Near Earth Objects and extend the time between discovery and impact for all potential astronomical hazards. 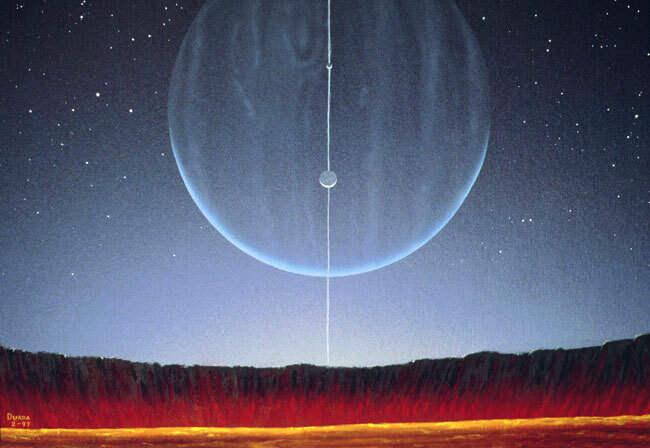 Pictured above is an illustration of a busy planetary system, showing the view of a planet ringed with space debris from a recently formed crater of an orbiting moon.